Compare prices on car hire in Naxos Airport from all the major brands and find the best deals. When you book through us, unlimited mileage and insurance are always included in the price given. 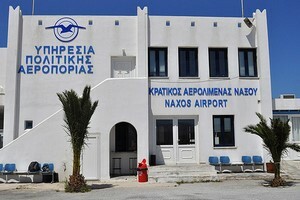 Naxos Island National Airport (JNX) is a very small airport located 3 km outside the capital, Chora on Naxos .There are regular bus connections between Chora and the airport. From the airport there are also many local buses that run to various places on the island. Many hotels are also responsible for transportation. It is possible to rent a car at the airport. From Naxos Airport yesterday detdaglig flights to Athens. It is open between 09.00 and 15.00. The airport has a small cafe.